We are learning about light and its effects. We discussed our ideas in groups. We explained why different children and characters in the story had the right or partly right idea. We explained why different children and characters in the story had the wrong or partly wrong idea. We needed to know how shadows are made. We needed to know what the sun does to shadows. We needed to know where in the sky the sun is, at different times of the day. We enjoyed watching the shadow of a stick change as we moved a torch around and above it. The torch was acting like the sun from sunrise to sunset. Children and mums and dads, can you fill in the missing words? At sunrise and sunset the shadows are……………………….. In the middle of the day, around noon, the shadows are ……………………. because the sun (in Summer) is …………….head. 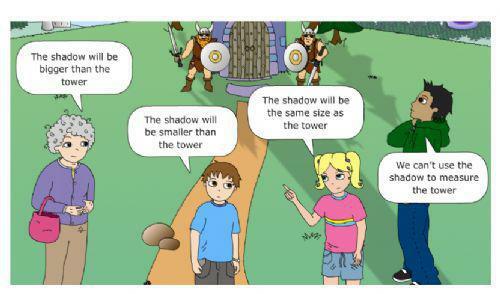 If the top of the tower is pointy, when the sun is in the west, the tower’s shadow will be pointing………….